In the manner of John Zorn's albums, Naked City and Spillane, the quartet, Mostly Other People Do The Killing uses a dose of humor on outside to draw you in and once the doors are shut--the music lets loose. Mostly Other People Do The Killing just by the name, will draw you to the album if you're in a record store or flying around online. Their album covers are a homage (detractors may say send up) of their influences (Ornette Coleman, Roy Haynes, among others) but at it's core, this is a group that is as fierce, improvisational and engaging as they come on today's scene. It's only been seven years but it feels like MOPDTK have been together 20 years. While the band was conceived by bassist, Moppa Elliott, they act as a free flowing unit with no clearly designated leader. And that's what makes them even more exciting. Their latest release, The Coimbra Concert, their debut for Clean Feed Records, is probably the best installment of their manic personalities come to life. And it's well worth your investment. Recorded live in Brazil last year, the album cover pays tribute to the legendary, Keith Jarrett Koln Concert (ECM Records). But let's dive into the music. Covering material from all four of their previous albums (mainly coming from the last three) MOPDTK showcase their innate ability of playing point/counterpoint but still enabling the listener to find the melody as evident on the frenetic but beautiful "Round Bottom, Square Top." This is almost a New Orleans swing that quickly goes off the rails but you go with it and the results are phenomenal. "Drainlick", for me, has a John Zorn quality that is chaotic but exquisitely composed Moppa Elliott. Peter Evans and Kevin Shea rip through chord changes at a dazzling pace while Irabagon and Elliott and some rich texture around the outside making this highly compelling piece and you get that up close, live feeling. While improvisation is the key to this quartet you still get an element of humor an homage as evident in the mid passage of "Blue Ball" (from their fourth album Forty Fort) when the band breaks in a very different tempo of "A Night In Tunisia" (from their second album Shamokin'). The funky yet avant garde "Pen Argyl" also from Forty Fort, immediately takes its outset from Coltrane's A Love Supreme but blends in elements from New Orleans, New York and beyond. A crafty mixture that is a lot fun to absorb. "Elliott Mills" taken from the group's first album, albeit the shortest track on the album is still a wonderful bit of deconstruction of jazz theory by this quartet that must be heard to be believe. In many ways, a live show is the best way to experience an artist or group. It's only then that you get the full breath and vision of their compositional thought. 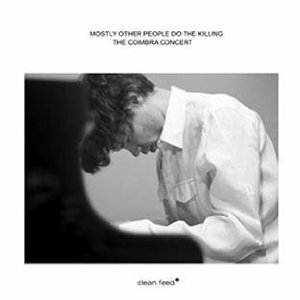 And with The Coimbra Concert that is exactly what you get with Mostly Other People Do The Killing. For me this would be the album I would recommend venturing to first. You will get a huge understanding of the band and be able to experience music from all of their albums. Then of course you need to go back a get the studio albums as well. So don't let their artwork and song titles fool you. Mostly Other People Do The Killing mean business and they do it quite well.